Albania’s EU Accession – A Pre-Crisis Déjà Vu? 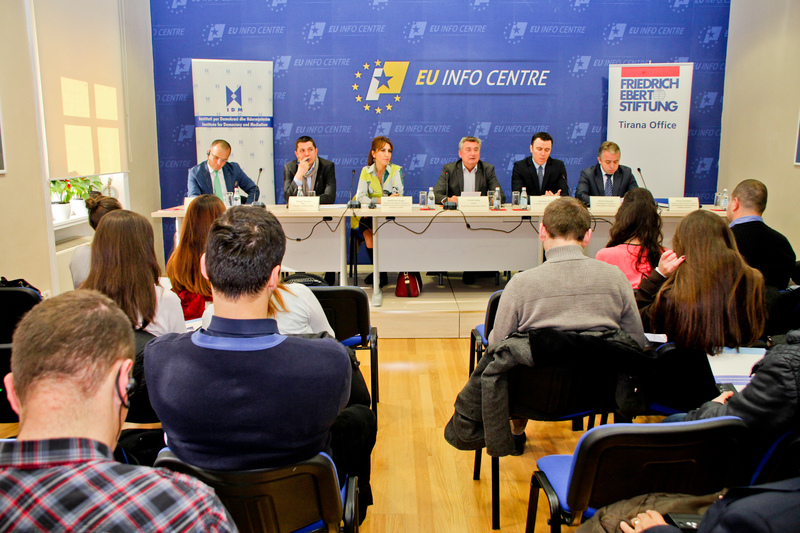 Institute for Democracy and Mediation, with the support of Friedrich Ebert Foundation (FES), organized on 12 December 2014, at the premises of EU Info Centre, the panel debate: “Albania’s EU Accession – A Pre-Crisis Déjà Vu?”. The event aimed at focusing on how to make (local) sense of Albania’s EU integration process, what role for civil society and how to reroute efforts instead of resorting to the comfort of “enlargement fatigue” (in Brussels) and hesitation over political dialogue (in Tirana). 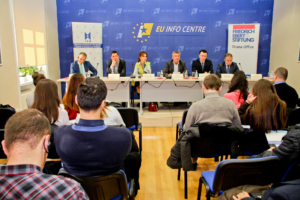 The debate panel was composed of Majlinda Bregu, Gentian Elezi, Frank Hatke, Afrim Krasniqi, Geron Kamberi, Gjergji Vurmo, and moderated by Endri Xhafo. The opening remarks were addressed by Frank Hatke, Resident Director of FES in Albania. The discussants underlined the necessity to further progress on Albania’s EU integration pathway. There is an urgent need for attaining a constructive political dialogue at the domestic level, as an essential tool for the overall enhancement of the reforming process. In this regard, the judicial reform is of primary importance, as it constitutes the backbone of the fight against impunity, corruption and organized crime. 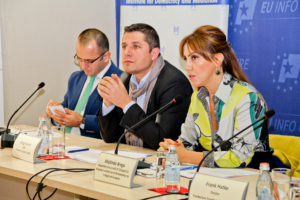 Furthermore, Gjergji Vurmo presented IDM’s latest brief commentary on “Albania’s EU Accession – Is It Risking A 2009 Déjà Vu?”, which elaborates on the current state of the process, the impact of confrontational politics in Tirana and developments within the EU. The present confrontational politics is harming and postponing Albania’s opening of the accession negotiations, and since the membership to the European Union is considered a national objective, then both parties should demonstrate political maturity and find consensus. Overall, the event saw the participation of civil society experts, political representatives, journalists, scholars and students. Previous Mapping the leaders in Macedonia and Albania: can elites promote positive social change?